carved stone horse, monkey . Dispatched with Royal Mail 2nd Class. Have no idea what it is. We hope cooperate with you in the future. We will do as we promised for you. Weight: 1150 grams. Cast in 2 parts, hollow and hand painted. Stands approx 11" tall (28cm). Three Wise Monkeys. hand turned / carved. speak no evil (far right) missing most of his right foot. bovine bone on amber?. Moulded plastic model of the Three Wise Monkeys – Hear No Evil, See No Evil and Speak No Evil. The moulding is nicely detailed. I believe that they are made of resin or a similar man-made plastic. The moulding is crisp and I believe that they are made of resin. Tiny hand carving 0.75" 2 cms long - good antique condition. These clay balls are larger than the mouth opening so they can not be removed or fall out. - I know the winner of this pair will be delighted with them. - Good luck! A nice quality hand cast solid bronze statue, with nice detailing. In nice used pre-owned condition, and as photos show still displays very nicely. U.K=£5 OR YOU MAY OF COURSE COLLECT. If you receive the item and feel it is not as described . Hand carved 0.75" 2 cms long - good antique condition. I hope you can see the details. I will bring you high quality service. Lovely rare Old Cloisonne enamel Handmade Cat Figure Statue miniature teapot. Dispatched with Royal Mail 2nd Class. I will try my best to resolve the problem. Here is your chance to own an important empowered item now. We wish you all much good luck in obtaining this sacred one. Super nice! As you view in the images, it was Very nicely finished and complete with many fine details. This is a great piece of valuable collection, a valuable personal alter or a very good present. Don't miss out this chance to get this it and brings good luck to you! I will try my best to resolve the problem. I choose high quality logistics services. LOOKS LIKE BONE - BUT POSSIBLY MADE FROM CELLULOID?. DATING FROM THE EARLY 20TH CENTURY ART DECO ERA. We will resolve it for you in 24 hours. 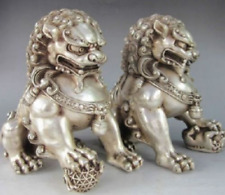 Weight: ( 60)g.
Material:TIBETAN SILVER TOOTH. We will resolve it for you in 24 hours. Weight: ( 140)g.
Weight: (162 )g. We will resolve it for you in 24 hours. So we will be reasonable and equitable to solution your problem. This is a great piece of valuable collection, a valuable personal alter or a very good present. Don't miss out this chance to get this it and brings good luck to you! Here is your chance to own an important empowered item now. IT IS 40 GRAMS IN WEIGHT. We will resolve it for you in 24 hours. Weight: (98)g.
Making Process : Genuine h andmad e. Weight: 38g. I believe that communication is the best way to solve the problem. Every picture is my own shooting. Region Of Origin： Original. Making Process: Genuine handmade. We collect the folk fine art from China. We will resolve it for you in 24 hours. Weight: (77 )g.
We will resolve it for you in 24 hours. Weight: (72 )g.
Weight: ( 69)g. We will resolve it for you in 24 hours. Making Process : Genuine h andmad e. Weight: 75g. I believe honesty and credibility is the best policy. Good wishes. Making Process: Genuine handmade. We collect the folk fine art from China. Making Process : Genuine h andmad e. Weight: 62g. We will resolve it for you in 24 hours. Weight: ( 704)g.
We will resolve it for you in 24 hours. Weight: ( 405)g.
We will resolve it for you in 24 hours. Weight: ( 126)g.
We will resolve it for you in 24 hours. Weight: (94)g.
Material:COLOURED GLAZE. We will resolve it for you in 24 hours. Weight: (704 )g.
Antique Chinese Cornelian a pair of "Mandarin Duck "